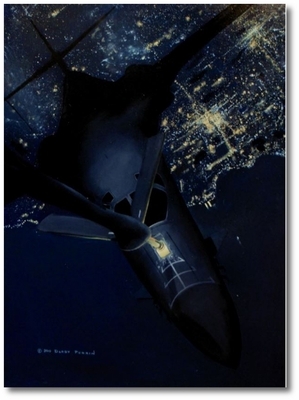 Overall size: 24" x 18"
The B-1 Lancer is a four-engine variable-sweep wing strategic bomber used by the United States Air Force. It was first envisioned in the 1960s as a supersonic bomber with Mach 2 speed, and sufficient range and payload to replace the Boeing B-52 Stratofortress. 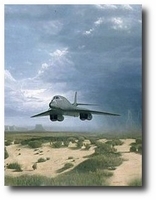 It was developed into the B-1B, primarily a low-level penetrator with long range and Mach 1.25 speed capability at high altitude. This one is seen refueling at night from a KC-135 boom operator�s point of view.